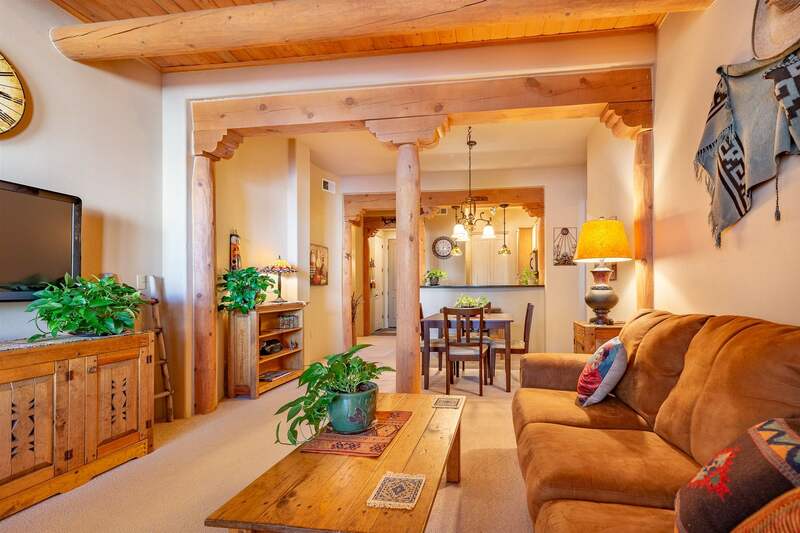 The Spirit of Santa Fe comes alive in this enchanting condominium overlooking lush pool grounds. Occupying 1171 sq ft, this 2 bed/2 bath, second floor residence offers Pueblo style throughout luxury elements that include Vigas and beams, a gas Kiva fireplace, granite and slate countertops/flooring, stainless steel appliances, 2 walk-in closets, washer/dryer combo, office nook, and a gorgeous wraparound patio with commanding views of the pool court. In addition, a separately-deeded GARAGE and vast STORAGE UNIT provide added value and convenience. Truly pristine, this one-owner, lightly-occupied residence shines with pride of ownership, with, in addition, many recent upgrades and the opportunity to purchase FULLY FURNISHED (if desired--please inquire.) Located in the Alameda Condominiums, this luxury complex offers onsite management, fitness center, business and meeting rooms, community club house, gated parking and 24 hour controlled access. Just 12 minutes from the Plaza in the hub of lively shopping and entertainment, this condo offers a luxury lifestyle unique to Santa Fe. Directions To Property: Cerrillos Rd To E. On Vegas Verdes Dr. Left Into Alameda Condos. Lockbox 204 On Gate To Left Of Building Entrance, Door Code In Lockbox And In Showingtime. Once In Lobby, Go Up Stairs In Right Corner To 2nd Level. Turn Right. Follow To Condo 204 On Left. Elevator Instructions: Go Through Lobby, Turn Right, Follow To End To Elevators A1 To 2nd Floor. Exit Elevators To Right, Follow To Condo 204 On Right.